Oatmeal Bake and Take Cups Recipe The First Coffee Ever ... Made WIthout Beans! Beat cream cheese and Do You Bake? Blueberry Blast Cheese ball mix together until light and fluffy. Beat in Ricotta cheese and gently fold in blueberries or blackberries and set aside. 1Combine Do You Bake? Buttermilk biscuit mix with the butter until crumbly. Add water and stir until just combined (do not over mix). Roll and cut your buttermilk biscuits into 1" rounds or pinch 1" portions off and roll them in between your hands and flatten slightly. Dip your biscuits rounds in your cheese mixture and coat well. 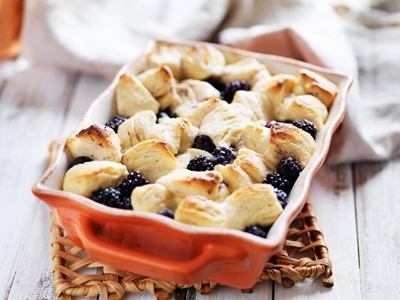 Place your coated biscuit pieces into your baking dish and spread any remaining blueberry mix on top. Top with any remaining biscuits and lightly dust with granulated sugar.